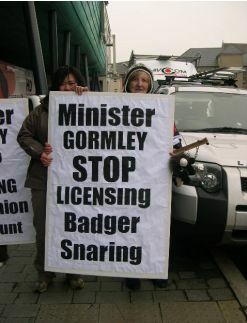 Badgerwatch and The Irish Council Against Bloodsports (ICABS) held a peaceful protest at the Green’s Party conference in which was held in White’s Hotel, Wexford on the 8th March. Both groups were highlighting their anger and concern at the lack of action by Minister John Gormley whose Department - Environment, Heritage and Local Government - continues to licence the brutal snaring of badgers for ‘scientific purposes’, continues to allow carted stag hunting and has ignored pleas for the outlawing of live hare coursing in this country. There are no immediate plans by the Department of Agriculture, Fisheries and Food to halt badger eradication. The long-awaited badger vaccine will not, according to DAFF documentation, be available before 2013. Figures released by DAFF for 2008 (January to 31st October) indicate that 5,427 badgers were eradicated. The number of TB reactor cattle removed in the same period rose to 25,406 which was an increase on the 23,071 removed in 2007. It would appear that DAFF’s massive badger culling operations are having little impact on the war on bovine TB. Questions about the numbers of non-targeted species, i.e. foxes and dogs caught in DAFF badger snares were raised at the Department’s Conference held in Dublin, October 2007. The reply given to Dr. Richard Yarnell, former CEO of the Badger Trust (UK) was that they didn’t collect that data. We were told that they caught lots of dogs and some foxes and that they were ALL released. Now we know this is incorrect and an unknown number of foxes ARE shot by DAFF’s badger trappers. Badgerwatch has had a number of reports from people who live in areas where this is happening. Are we surprised? Simple answer is no. Persons who carry a licence to trap and shoot badgers (a protected species!) for a living would probably be the last persons in the world who might be tempted to release an unfortunate fox (not legally protected) live from a snare. The fate of the doggies remains unknown. POLICE SWOOP ON BADGER BAITING RING. The inquiry runs in conjunction with the USPCA prompted a series of police raids yesterday on the homes of blood sports enthusiasts in Ulster. Six dogs including three pit-bull type terriers were seized at one location in county Armagh. More raids are planned for today. Authorities in the Republic are unable to mount similar raids on the homes of badger baiters identified in the six month investigation. There is no provision in Irish legislation to allow the seizure of abused animals from private property. Until now, the existence of organised badger baiting was considered to be something of an urban myth. But a Sunday times journalist infiltrated an international blood sports network operating between Ireland, Britain, France and America. Dog breeders were secretly recorded offering to sell terriers that had been specially bred to bait badgers. Footage of wild badgers being dug from their setts and baited in County Down was also obtained. The inquiry also uncovered a lucrative trade in terriers used for the illegal blood sport. A prized fighting terrier exported from Ireland to America last January was sold for €10,000.The investigation has also prompted renewed calls on the government to introduce further legislation to protect animals and stop illegal bloodsports. Stephen Philpott, the USPCA’s chief executive, said the joint investigation revealed that badger baiting was a more organised pastime than previously thought. He said the network may have thought it was untouchable, but with the information gathered during the investigation would enable police and USPCA inspectors to raid homes and kennels. “We have identified the people behind this bloodsport and their cohorts in Europe and further afield,” he said. The late Tony Gregory T.D. It was without doubt, a sad day when the announcement was made. Tony, who was Dublin Central Independent T.D. died on January 2nd after a long illness at the relatively young age of 61. Our wildlife had lost one of its staunchest allies. 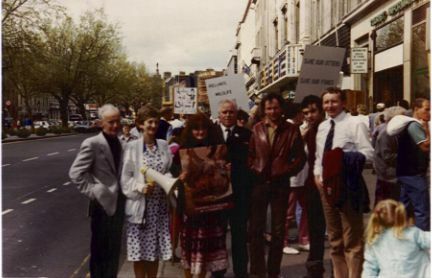 Tony is seen here (third from the right) at a protest in Dublin some years ago. Tony championed local issues, social justice and will forever be remembered for his fearless commitment to the drugs’ problem. Equally so, his dedication to wildlife issues is on record. He never turned us down when help was needed. In 1993, Tony’s Private Members’ Bill to outlaw live hare coursing was defeated in the Dail. An activity which was and remains to this day, repugnant to the vast majority of Irish citizens somehow failed to get the backing of our elected representatives. Tony will be missed by all who had the privilege of knowing him. Delegates backed an Ogra Shinn Féin motion calling “for a total ban on all blood sports, including hare coursing and fox hunting”. Dublin Ógra member Aine Downes said 30 hares had been killed at recent coursing meetings. The ardfheis rejected a separate motion from cumainn in Ardfert, Co Kerry, and Thurles, Co Tipperary, calling delegates to accept that “hare coursing is not a blood sport, and that it opposes any attempt to ban a popular rural sport”. In a response to questions from the Public Accounts Committee, DARD admitted it is about to implement a pilot badger cull with permission to kill 1,000 badgers in a bovine TB intense area. DARD claims that the purpose of the cull is to gauge how many, if any, were carriers of the disease. DARD remains determined to squander public money on a pointless cull. measures at the farm gate. Mr. Rendle also challenges Department claims that profiles would be built on the results of the cull and recommendations made for the future. and yet DARD has failed to collect and use that data efficiently. Date: 06 April 2009 11:45. The Northern Ireland Badger Group is an independent, not for profit initiative which aims to promote the understanding, protection and welfare of badgers. It opposes all inhumane acts against badgers including baiting, digging, gassing and snaring. The NIBG is affiliated to the Badger Trust and works closely with Badger Watch Ireland. The group seeks to work with the farming community to resolve the bovines problem. However there is no scientific evidence to suggest that culling badgers is in anyway an effective measure against TB. <http://www.badgersni.org.uk/> Press contact: Timothy P Clarke on 07743740938 Email press@badgersni.org.uk From: "Badger Trust Press"
For a most riveting and enlightening read be sure to pick up Bad Hare Days by John Fitzgerald, a lifelong campaigner against blood sports. The 400-page memoir reads more like a thriller than your typical autobiography. In it he recounts how he became involved in the campaign to protect the endangered Irish Hare, which faces a twin threat from coursing/hunting activities and the loss of habitat caused by urbanisation and modern agriculture. John Fitzgerald paid a high price for his stance against blood sports...bullying in the workplace, including assaults; the loss of his job with a Farmer's Co-op, and a series of arrests and interrogations at the height of the militant anti-coursing activity of the 1980s when mysterious night-time raiders sabotaged hare-holding venues and released the fleet-footed creatures from captivity. Though not part of this underground movement, with its clandestine balaclava-shrouded figures darting about like shadows and creating mayhem within the greyhound industry, the author of Bad Hare Days was targeted frequently by the Forces of the State, wrongly and unfairly, due to his high profile in the legitimate anti-hare coursing campaign. His no-holds-barred accounts of interrogations, dramatic courts cases revolving around alleged "ALF" actions, and the treatment meted out to protesters on the picket lines by coursing fans... make for compelling reading. The book is written in a free-flowing, highly readable style and once you open it you won't be able to put it down. It is alternately shocking, thought-provoking, informative, and quite hilarious in a darkly comic way. Anyone remotely interested in animal Rights/welfare/protection causes or in the politics of environmental activism will find this book immensely provocative Bad Hare Days is published by Olympia Publishers in the UK. It can most easily be obtained from UK Amazon (amazon.co.uk) or your local library will order it for you. Perhaps it is best to approach your library because once it is available there its message will reach a wider public. following an announcement by Elin Jones, Minister for Rural Affairs. decision marks the start of a brutal pogrom against badgers. "Elin Jones has ignored the weight of scientific opinion  and caved in to bullying farming unions and cull-mad vets. Jones will have no idea which particular measure reduces the disease. as pressure mounts to repeat this brutal extermination elsewhere." delivered [4,5]. "These problems also exist in Wales, but rather than putting farming in order, Elin Jones has decided to make a scapegoat of badgers instead. This is cheap, nasty politics of the very worst kind." means possible to stop this cull going ahead." Steve Clark in Cardiff on 07867 673054 for TV, radio and press. (press interviews only). Gordon Lumby in Ceredigion on 01570 480571 or 07837 260219 for TV, radio and press. "Cattle, not badgers, are the primary reservoir of bovine TB. into reverse. The science shows it can be done, but it requires real political will to deliver that objective." For further comment, contact David Williams on 07768 518064. A CANTERBURY farmer has admitted recklessly interfering with a badger sett by using a burrow blaster to blow it up. David Botting, of Island Road, Upstreet, Canterbury, admitted to magistrates on Wednesday (October 22) that he put the Rodenator down into the ground on the badger sett and set it off. The pest controller is normally used to collapse rabbit burrows, but interfering with badger setts is illegal. In a case brought by the RSPCA with the support of Natural England and a police wildlife crime officer, the court heard there was evidence it was a live badger sett and badgers had been seen in the area. The court was told the farmer was trying to get rid of rabbits but did not check to make sure he wasn't interfering with a badger sett. Magistrates ordered him to pay a total of £2,262 in fines and costs. RSPCA Inspector Teresa Potter said: "It is vitally important that farmers carry out an environmental assessment before using these kind of tools. It is breaking the law to interfere with a badger sett." A blasting device now widely used to destroy rabbit warrens across Lincolnshire must not be used to kill animals, the Government has warned. The Rodenator collapses animals' underground tunnel systems by pumping them full of oxygen and propane and igniting the mix to create an explosion. Now Natural England, formerly known as the Countryside Agency and English Nature, has urged landowners to consider the consequences of using a Rodenator. A spokesman said: "Although designed to kill, Rodenator type devices must not be used for killing wild animals in this country. "Legally, they can be used to collapse burrows and tunnels if there are no animals present, and used in this fashion they do not require a licence or Defra approval." In a promotional video for the device, Ed Meyer, spokesman for its creator Meyer Industries, says: "It creates an enormous underground concussive force, an expansion of gases that instantly and humanely eliminates any burrowing pest you may experience. "People comment to me all the time about the Rodenator, I'll see them in trade shows around the country, and obviously the big comment is 'man we blew those suckers out of there, they were gone'." John Lill (79), a Louth pest control trainer said: "This is a barbaric piece of equipment. "Rodenators should definitely not have been brought into this country." The Lincolnshire Machinery Ring, an organisation which leases out agricultural equipment to farmers, has seven rodenator machines in regular use. LMR spokesman Ian Dawson said: "The Rodenator does make quite a disturbance. "But our aim is to destroy burrows rather than wildlife."